The circus is in town! 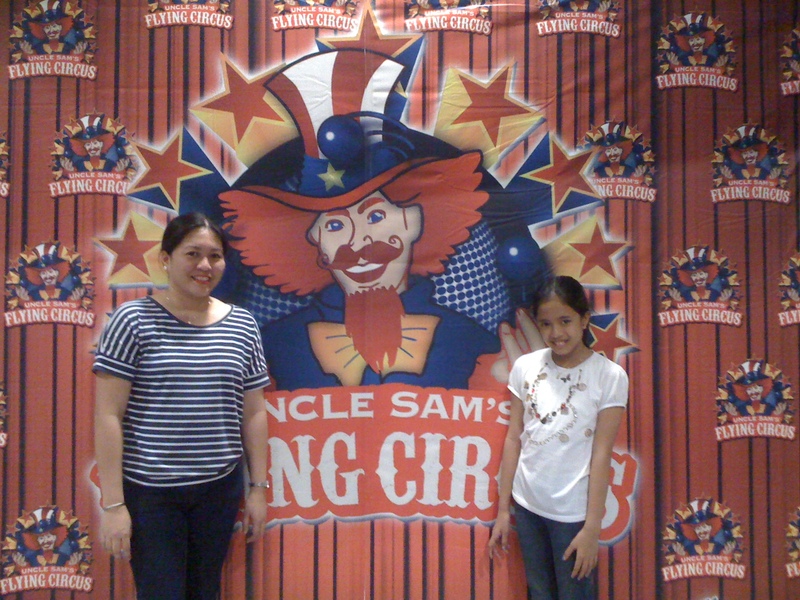 Well, Uncle Sam’s Flying Circus that is, minus the show elephant and feisty lion. :) But the rest of the circus casts are present–the aerial acrobats (check), the jugglers (check), the contortionists (check), the heart thumping pole and silks performers (check), the clown (check), and some added bonus too, two famous icons that fit just right in the circus setting, Lady Gaga and Britney Spears themselves (show impersonators-check)! Uncle Sam’s Flying Circus is comprised of a professional cast of fifth and sixth generation circus performers, headed by New Zealand-based promoter and Harris Agency CEO Doug Harris, and show producer Enrique Valencia — himself a versatile circus performer with several years of professional experience in the global entertainment circuit. What can I say, it was one helluva show, ah-maze-balls in fact. The first half of the show was opened by the Princess of Circus herself, Britney Spears (hehehe) doing her thing on the dance floor, while some aerial acrobats impressed the audience with their skillful performance. 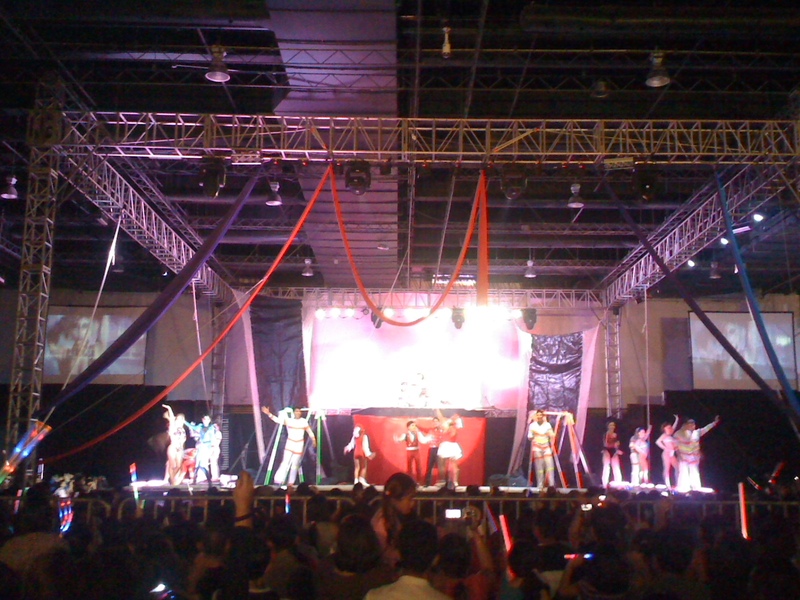 Next act came from the jugglers of Mexico who did some fancy dance moves and poses while juggling pins. It was followed by the Onofre family from Latin America who wowed the audience with their acro-balancing that showed good precision, timing and (sigh!) courage. The most exciting part came when the Genesis Duo from Cuba, Senyas and Fern (hope I got their names right), demonstrated impressive flexibility, strength and dexterity while doing their acro-balancing/contortion act. Another spell bounding performance came from Orianda of Mongolia, a two time Monte Carlo International Circus Festival champion. Her ability to twist and turn limbs in limitless positions is both eye popping and jaw dropping. Of course, any circus won’t be complete without the clown. In this case it was Momo the Clown who managed to illicit laughs from the audience with the usual clown antics. I enjoyed the first half of the show more than the second half though. The second half was more or less the same acro-balancing and aerial contortion performances. Good thing it was only for a good 30 minutes as compared to the 1 hour run of the first half. I did not find the much awaited highlight of Uncle Sam’s Flying Circus, the Double Russian Swing act, impressive too. This act involves two giant steel swings that allow performers to rock back and forth to create momentum as they launch themselves 25 feet in the air. Maybe because I was still reeling from Orianda and the Genesis Duo’s very good performances. To me, those where the highlights of the whole circus act. Lady Gaga, played by Athena, who is currently ranked No. 1 as Lady Gaga’s tribute artist in the world, finally made an appearance in the second half. Much to the delight of the kids who were lured into buying the lighted swords as they were instructed to wave this in the air when she enters. Well the 300 pesos sword wave lasted only for a minute or so. I have to give it to both Britney and Lady Gaga impersonators though coz they did a pretty good job, they really played them up well. Tickets are being sold for VIP 1750, Platinum 950, Gold 650, Silver 350 and Bronze 150. Of course we got the Bronze. Since we have an SM Advatage card, the 150 ticket price was reduced to 128 due to the 15% discount exclusive to SM Advantage members. So bring your card along with you if you plan to watch this. We were glad we chose the bronze ticket coz SMX hall isn’t really that big, you need not be in front to enjoy the whole show. In fact we were seated about only 40 rows away from the stage and there’s just this thin railing that separates silver from bronze. We pretty much had a good view of the stage from where we were seated. Our distance is such that we got a complete view of the stage in every angle unlike some of the VIPs and Golds which were seated at the sides. The organizers were kind enough to assist us when we approached the booth because my mom, who walks with the aid of the cane, was with us. We didn’t have to join the que, they allowed us to come in right away. I guess that’s why we got the good seats in the bronze section. I suggest that you go there 45 minutes early to be first in line if you are planning to watch. There are also food stalls inside so no need to worry about getting hungry during the show. 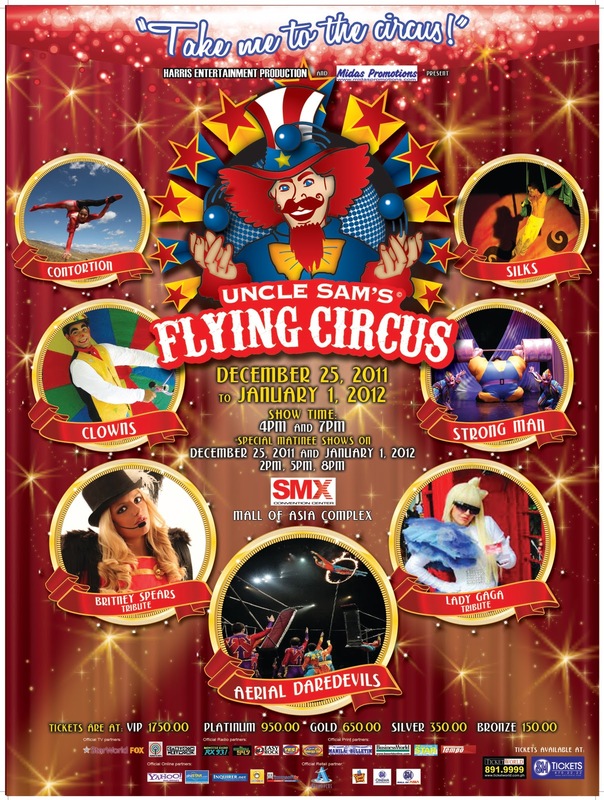 Uncle Sam’s Flying Circus will be here in Manila for a series of show until January 1 then they will head to Cebu on January 4 and 5 to perform there. Catch them at SMX Convention Center Hall 1 and 2. Matinee show starts at 4 pm with evening show at 7 pm. You can buy tickets at any SM Ticketnet outlet or TicketWorld. For details you may call 470-22-22 or 891-99-99.